We all know Amritsar is the golden gleaming sun on the face of earth, with its beautiful and unrivalled architectural wonder- Golden Temple. Founded in the year of 1577, it was established by the fourth Sikh guru- Guru Ram Das. Nestling a modern day wonder and reason of awe of every spectator there are thousands of reasons to visit Amritsar. Golden temple is just one of the most prominent one. It is one is the holiest pilgrim spot in Sikhism, but its beauty and serenity has attracted and made every person- no matter of what religion they follow bow humbly. However, it would be a little unfair if we keep our Amritsar tour restricted to just ‘the Golden Wonder’. In fact, if you are counting Amritsar to be a city spotted with old building and typical hyperactive city then get ready to be surprised. The city is growing out from its always-bustling shell and is calmed and painted with rather modern landscape, graced with the pedestrian walkways, gorgeous avenues and alleys, the enchanting old-city charms of the bazaars and street food that is loaded with taste buds blasting surprises. What are the places to visit in Amritsar? With our illustrious mention of the golden temple already, we are sure you would love to know more of this gorgeous architecture’s history, spiritual importance and much more. The legendary monument was build around 1577 by the fourth Sikh guru- Ram Das. You will find it interesting that Golden Temple is in actual a small part of the huge and massive Gurudwara complex known as Harmandir Sahib. The architecture of the temple is one to cherish. Built with 100% gold, this gleaming temple is perched in the mid of the tank surrounding it with water all around. There is a belief entailed with the lake and that is the tank is said to have healing power and people who bath in the sacred waters are freed from diseases. The architecture is inspired from Hindu Islamic architectural styles and the entire complex is exemplary in very sense of eccentric and intricate craftsmanship. It is the temporal seat of Khalsa brotherhood, which is placed every morning for spiritual seekers to bow and pay their prayers and in night it is again confined in the temple. Here you will see the sacred weapons once owned by Sikh Gurus. Guru Ka Langar is one of the most humane activities that is run down here at Golden Temple. Each day, a large population which is estimated about 100,000 people are fed in complex. The best part is the food is entirely free and there are only donations which are also recorded and well maintained. In fact they even give you a receipt of the donations made here. Volunteers come here serve and help in many activities that are catering, cooking and serving the community. The central shrine is the most popular attraction here. It is a gleaming tank of water on which in mid is perched the Gurudwara complex. As we said it is said to hold sacred powers for healing diseases. The lake is known as Amrit Sarovar giving Amritsar its name. Unique and a heart-touching way to acknowledge the loss and poignant tragic event of partition, the complex is a 19th century town hall that holds portrayals of tragic events during the partition. Here are the newspaper cuttings, photographs, video interviews and heart-breaking stories and records of people- telling the events and its turns from their point of view. It is a touching monument that is record of the world’s biggest human migration on the face of history of the modern world. The entire structure of the complex is labyrinth. This Hindu temple of goddess Lal Devi Mata is accredited of being improver or granter of fertility and is fascinating due to its architecture. It was built in the 20th century and is adorned with mirrored mosaics all around. It is a sight to behold when sunlight refracts through the colored glasses and decorates the walls and dome with a rather kaleidoscopic manner. Amritsar is historically laden, specially the pre-democratic phase of India. One such monument is Jallianwala Bagh, it is one of the most saddening events that is entitled to the history of Jallianwala Bagh. The park is the witness of brutal strike of 1500 Indians killed and wounded on the order of British officer, shooting frantically on hundreds of children, women and men who were unarmed protesters in 1919. You can still feel the chills when you see the bullet holes that are still visible in the walls. The well here hundreds of people leapt to avoid the bullets of Dyer. In their remembrance an eternal flame is lit and a whole gallery is dedicated to portraits of freedom fighters. If you are looking forward to visiting the city of golden temple Amritsar, then you have done it the right way. In this season that is the time between November to March sits perfectly right to visit this amazing city. In fact its is the most pleasant time of the year. And it is this seasons that you are able to witness the Golden temple at its most prime of the year. The mist, the dues the glisten golden gleam of the first ray of the sun falling to get fragmented on the golden dome of the temple is just something to witness. Not very day, but of course if you are planning to visit the golden temple, try to make it on the birth anniversaries of the Sikh Guru’s. There is a vast celebration, fairs are held and the lights just make the sight of the temple in amidst the glowing waters is just beautiful. It is enigmatic, and mesmerising at the same time. What can you do in Amritsar? 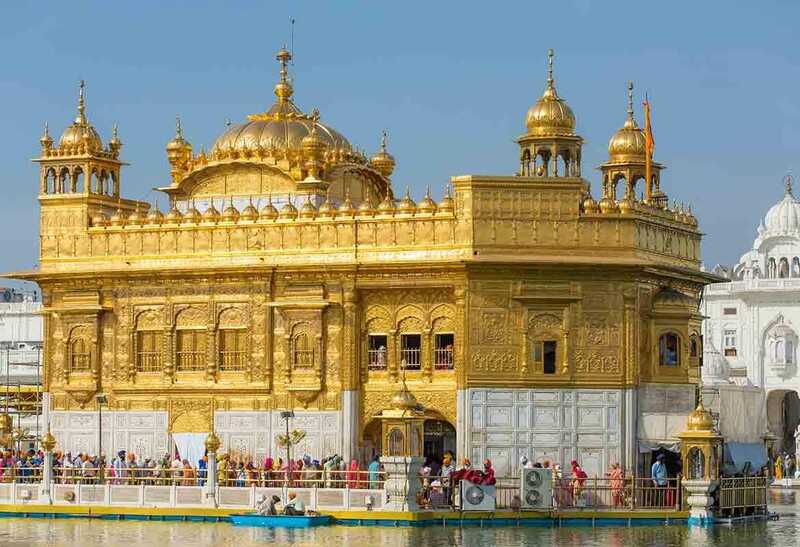 Apart from travelling and visiting the highly-regarded tourist places of Amritsar like- paying your tributes at Jallianwala Bagh, Golden Temple, having a fantabulous langar in the campus, feeling the warmth and calmness of the Akali Takhat there are significantly a lot more things you can do here. If you think why we didn’t mentioned it earlier, sorry but the place is entirely another experience. It is one of the best ways to explore the historical monuments, it was built and modified later by Maharaja Ranjit Singh, and now it is under the governance of Indian army officials. The amazing architecture for years has been attracting a large crowd that are here to witness the glorious lives and valor of the Sikh leaders. This famous border lies between India and Pakistan where parades and other formal military ceremonies are held every day at 5 Pm. The programs are held before the closing of the border and here soldiers pay their regards and respect to their country. Shopping experience at Amritsar can’t be missed. Here you shop for a variety of things but what is famous here is the beautiful kamdari clothes and jewellery which is a speciality here due to the design pattern the gorgeous popping colors and their eye-catchy traditionalism. Furthermore here are the tradition leather footwear- known as Jutti which is also something you can never find elsewhere. And while looking for all this affordable prices with quality is assured at Hall Bazaar. The Punjabi food as it is world-wide known- for the massive calories silos and mouth watering taste can be truly realized at the small to big dhaba’s that dot the entire city. They are everywhere you don’t need to search for them and you can ask the locals about the best dhaba that they recommend people around Amritsar, are really good. Plus, they are very cozy and provide you the comfort of home here, the ‘khat’ the hand woven small beds and the big glass of fatty lassi can make your day. Don’t let the decor and simplicity of the place fool you, it is entirely hygienic. There are many other places where you get to live the history of the city, the Sikh culture and the true rhythm of the city. One such monument is the gorgeous palace revered museum where you get to know the history of the biggest and the greatest Sikh empire, the palace has glorious and beautiful paintings that depict the life of the empire. Here are also the arms and coins and personal stuff that was once the inheritance of the royal family. Next is the Sikh Museum, which depicts the martyrdom of the Sikh gurus. It is one of the biggest and the oldest attractions of Amritsar. The museum is a perfect place to help you understand the history and old events relative to the community. Hundreds of people around the world come here to see the vast collection of antiques and monuments of the Sikh guru’s, leaders and saints, warriors. The maximum number of days that are required to visit and explore the city entirely are two days. It is one of the best ways to experience the cities vibes and capture the true essence of life out here. Also one day is a must for the historical monuments while one day should be dedicated for the explorations of the food, markets, and of course the Wagh border and others.